Our mission is to enhance the Executive Suite experience and we will make every effort to exceed your expectations. 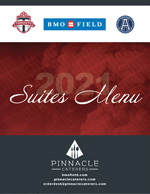 Pinnacle Caterers is the exclusive caterer to the Executive Suites at BMO Field and we bring with us over 30 years of experience in catering and restaurant operations. As a suite holder you and your guests should expect to receive the very best food and service from the moment that your order is placed until the time of your departure from your suite. Please sit back, relax and enjoy the event! During all events our managers and supervisors are available to assist you. Your Suite Attendant will be happy to contact them.